Linton Falls is a popular waterfall on the River Wharfe and is located at the foot of Sedber Lane which drops down to the river from Grassington. The falls formed where a fault in the earth's crust shifted millions of years ago, raising the limestone rocks to the north up higher than those to the south. Although fairly modest in height it is the largest waterfall on the River Wharfe. A footbridge leading from Grassington to Linton spans the fall. It is the fourth bridge to be located in this spot. The original Tin Bridge was built in 1814 for workers at Linton Mill, the current bridge was built in 1989 after the previous incarnation was closed for being unsafe the previous year. Linton Falls has two distinct sections. The first is a small and elegant curved drop, the second is a much less placid affair as the river is forced between limestone outcrops immediately below the bridge. The constriction of the previously wide river, combined with the small drop in height, creates a dramatic scene, particularly after spells of rain. It is a haven for birds and wildlife and is surrounded by moorland and grazing sheep. The tarn was given to the monks of nearby Fountains Abbey by William de Percy in the 12th century. After the Dissolution of the Monasteries it changed hands many times. Malham Tarn is a renowned nature reserve with its limestone lake, raised peat bog and fenlands. It is popular with anglers as the lake is home to some fine specimens of brown trout which flourish is the shallow pristine waters. With limestone crags and hidden waterfalls, the area is a pleasure to explore at any time of year. It’s somewhat exposed position makes it quite bleak but there is a field study centre at the grand and beautifully situated Tarn House. It was built by Thomas Lister, Lord Ribblesdale, in 1780 as a hunting lodge on the site of an earlier house. The preserved cellars probably date back to 1570. On the western shore, Tarn Moss can be seen, which is a wetland haven for wildlife and wading birds. Bird spotters will also be interested in walking to Malham Cove. This raw limestone escarpment is a known nesting place for peregrine falcons. Skipton is one of the best preserved and most complete mediaeval castles in England, despite enduring a three-year siege in the Civil War. After the Battle of Marston Moor it was the only Royalist stronghold left in the North. The Governor, Sir John Mallory, negotiated a surrender, and on 21st December 1645 the garrison marched out with colours flying and trumpets sounding. Cromwell ordered the removal of the Castle roof, but only ten years later the owner, Lady Anne Clifford, was allowed to replace them - on condition they were not strong enough to bear firing cannon. 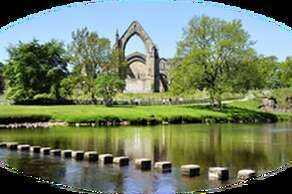 Today we can clearly read in the Castle's stones the story of this period of English history - and of many earlier ones, for in Cromwell's time Skipton was already ancient. Stump Cross Caverns is one of Britain's premier show caves, located in Nidderdale on the border of the Yorkshire Dales National Park. There are a range of facilities for a great family day out, including a gift shop and tea room as well as the caves themselves. The formation of Stump Cross Caverns began millions of years ago, when the area which is now the Yorkshire Dales was covered by oceans. Sediment from the ocean floor would eventually form limestone, the basic material from which the caves are made. The caves at Stumps Cross were discovered in 1860 by miners who were looking for lead seams in the Yorkshire Dales. Although they didn't find any lead, they did find the natural caverns which you can see today. Miners often didn't see any commercial value in the caves, however a man named William Neubold had vision enough to see that they could be a profitable enterprise and opened the caves to the public at a cost of 1 shilling per visit. 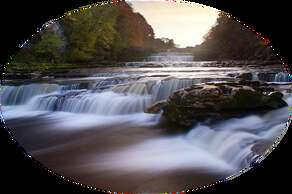 The three stepped waterfalls at Aysgarth have been a tourist attraction for over 200 years. Wordsworth and his sister Dorothy visited while they waited for their coach horses to be changed and Turnersketched them on a tour of the North. More recently they provided a dramatic setting for a scene from the Hollywood movie Robin Hood Prince of Thieves. The National Park Authority own Freeholders' WoodLocal Nature Reserve alongside the falls and there are several easy paths winding through it. In Spring, the wood is full of wood anemones and primroses. You may even be lucky enough to see roe deer darting away into the shadows. The riverside walk encompasses the heart of the romantic land scape which inspired some of our great artists and poets. Wordsworth, Turner, Girtin and Landseer were some of those who captured the beauty of the place in words and paint. Little has changed over the centuries;the cattle still come to drink from the river opposite the Priory. The natural spectacle of Brimham Rocks, with its giant rock formations, was created by an immense river, 100 million years before the first dinosaurs walked the earth, and a visit to this amazing landscape is truly a journey into pre-history. The rocks, sculpted by 320 million years of ice, wind, and the movement of entire continents, have taken on weird and wonderful shapes and with a little imagination, they resemble familiar creatures. Visitors are free to explore the site, spotting the Dancing Bear, the Gorilla, the Eagle and the Turtle, whilst the nimbler can crawl through the Smartie Tube and balance on the Rocking Stones. Some of the most iconic rock formations can be viewed only 10 minutes’walk from the car park, and it takes around four hours to explore all of this fascinating site, with its enduring landscape and carefully managed environment. From humble beginnings, the magnificent abbey was established by devout monks seeking a simpler existence. The atmospheric ruins that remain are a window into a way of life which shaped the medieval world. Green lawns stretch down to the riverside, a perfect spot for a picnic. Riverside paths lead to the deer park, home to Red, Fallow and Sika deer and ancient trees;limes, oaks, and sweet chestnuts.